When we moved in, we had no screens on any of the windows. The old frames were all under the house and we knew that we wanted to do the screens justice with the age of the house. We saved, knowing that screens were one of the best gifts we could have for Christmas because Kai has already been stung by a bee that flew into the house, along with moths, geckos, and flies. 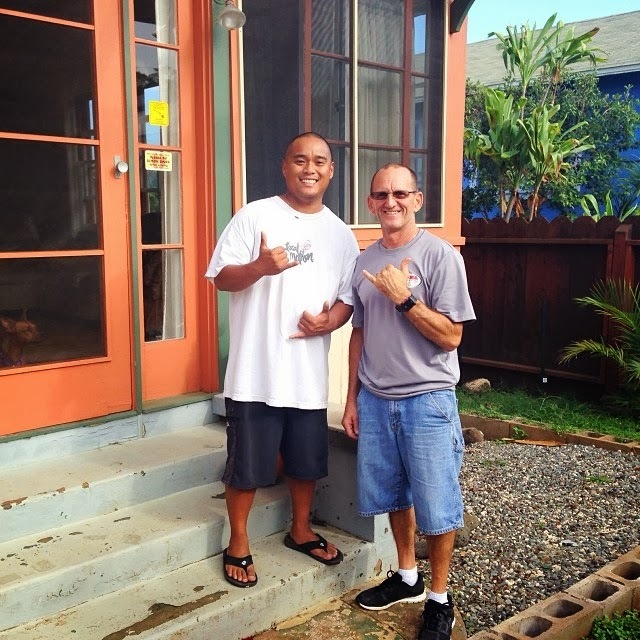 We finally had the money saved and our dear friend, Billy, who owns Aloha Screen Doors gave us a really fantastic deal to re-do the original screens. He delivered them today and he and Peter put them up all the way around the house. Not only that.... but in yesterdays mail was a surprise house-warming gift from someone I love dearly (don't know if she wants to be named publicly) who just saved our Christmas. So I'm feeling pretty overjoyed and overpowered with gratitude and thankfulness! !